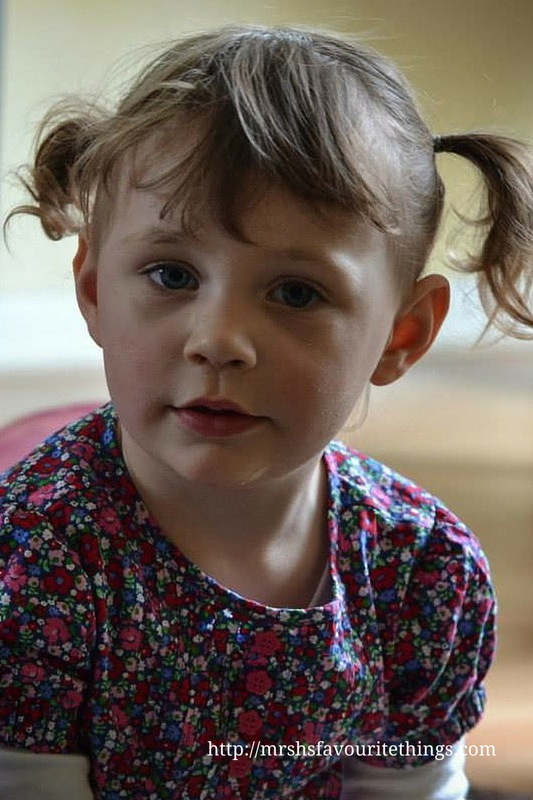 Back in May, Little Miss H turned the grand old age of two. Her birthday was a few weeks after the miscarriage and it crept up on me rather suddenly. We had decided that we would throw her a party the Sunday after her birthday. A week before the date, I realised that I had invited a few people to her party but that was it. I was completely disorganised and didn’t have a clue what I was doing. 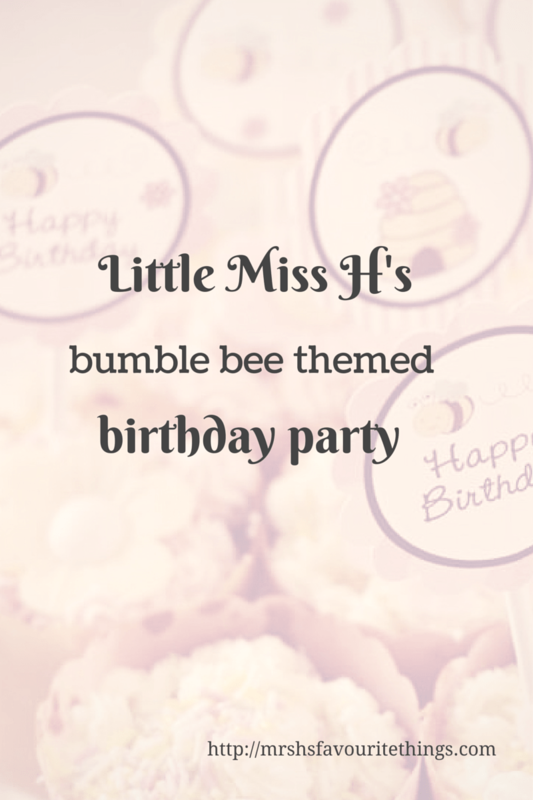 Thankfully, I was contacted by the lovely people from Feather Grey Parties and we were sent some gorgeous products from their beautiful bumble bee themed party set. I love all the products from Feather Grey Parties and Little Miss H is very lucky that her nursery is furnished with one of their lovely personalised pictures. I leapt at the chance of reviewing the bumble bee party kits. Plus, at a time of stress, it was perfect that I didn’t really have to think about getting bits and bobs for the party. Feather Grey Parties had done all that for me. Their website is easy to use and it handily groups the party sets by theme. Everything I needed for the bumblebee party was in one place. Images courtesy of Feather Grey Parties. We also received some cute party invitations (which I wrote the week before the party) and some thank you cards (as I publish this I have only written one of these cards to my parents). These wonderful cards really help to tie the theme of the party together. The original plan was to hold a picnic afternoon tea in Rochester Castle Gardens. In the end, the British weather won out and with half an hour to spare we moved the party into our flat. We laid the table, blew up balloons, put out all of Little Miss H’s toys and turned the playpen into a den. It was a mad rush but eventually, we were ready to receive guests. 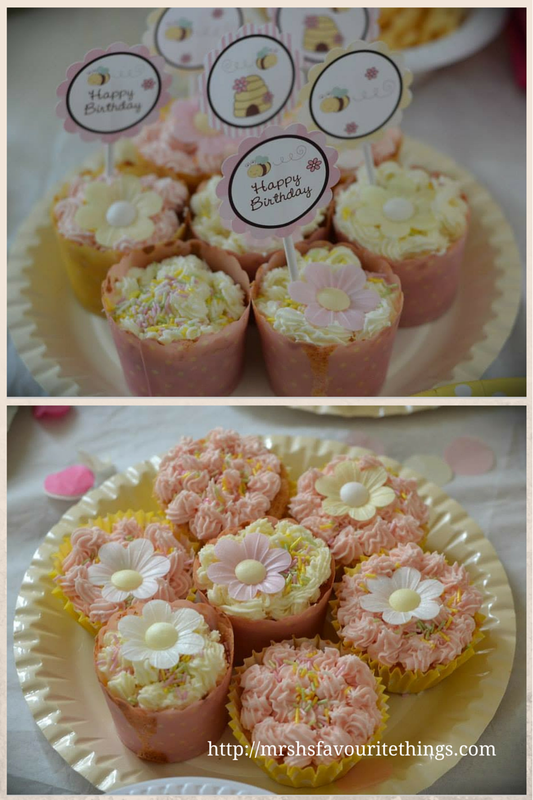 I had been baking most of the weekend and the table was scattered with a number of sugary treats: there were vanilla cupcakes with white and pink icing decorated with flowers and the bumble bee cake toppers; rocky road; smartie and chocolate button cookies and of course, birthday cake. I had also made cheese straws for anyone who fancied something savoury and for the children there were some obligatory bowls of Pom Bears. The table looked lovely once it was all laid out. I adored the combination of the pale pink and yellow. I added to the theme by placing some pale yellow shredded tissue paper in our hurricane lamps and the goodie parcels for the children (a bumblebee windsock for their gardens) were wrapped in pink tissue paper with a yellow ribbon. Little Miss H was actually ill for her party. The next day I took her to the doctor and she was diagnosed with a nasty ear infection and given antibiotics. Nevertheless, she was an absolute poppet on the day. She was thrilled to have all her best buddies and family around her and she was over the moon that she got to eat lots of cake, cookies and rocky road. The last-minute change of plans meant that we were in a rush to get ready for the party. 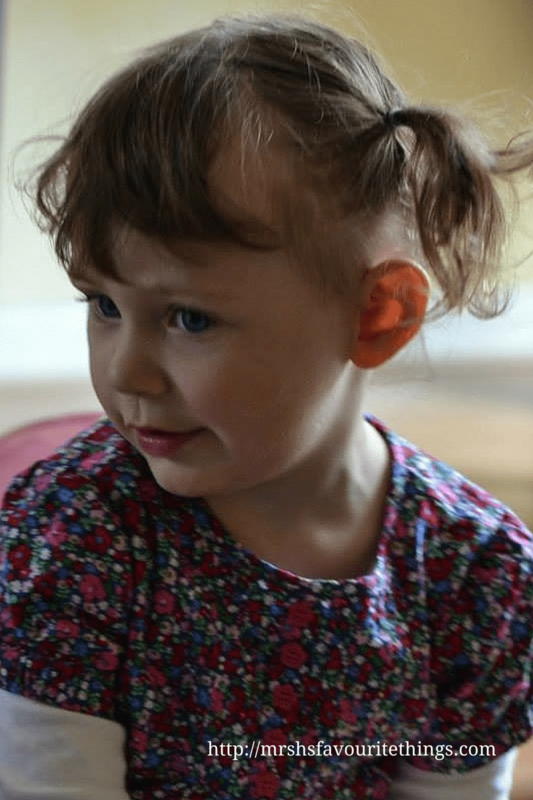 But I found time to dress Little Miss H in a beautiful shirt dress from JoJo Maman Bébé and Mr H put her hair up in some messy daddy-style bunches. She looked gorgeous. We had a lovely day with friends and family. There was cake, singing, giggling, bubbles, balls, balloons and bumble bees. What more could a two-year old want from a birthday party? Are you planning a birthday party soon? If so, have you thought of a theme? 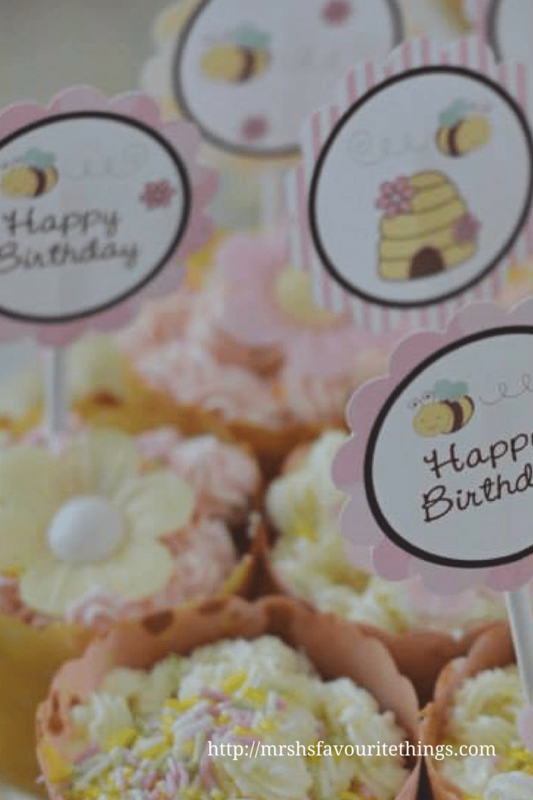 Why not consider a bumble bee themed birthday party? Disclaimer: I was sent the bumble bee themed party set for the purposes of this review but all thoughts and opinions are entirely my own. P.s. All photographs unless otherwise stated are courtesy of GW Photography. Oh, she looks so sweet. 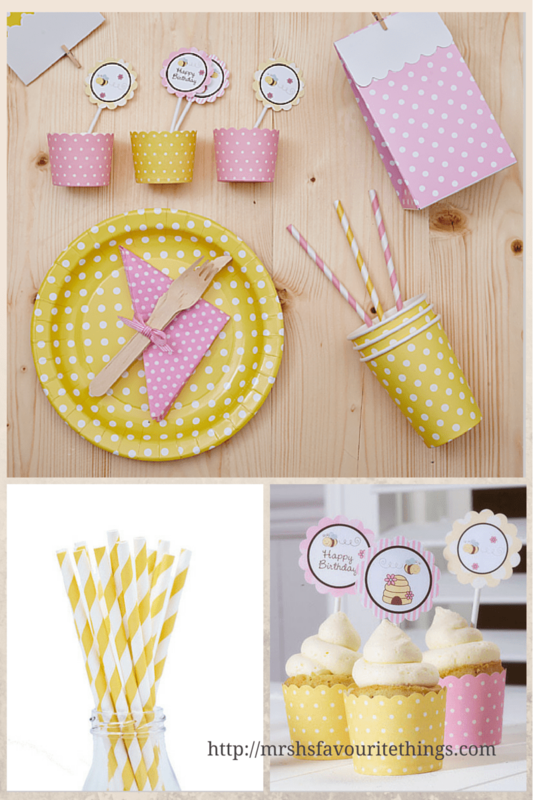 The bumble bee party supplies are gorgeous and those cupcakes look amazing! Awww shoe looks as if she had a really lovely time. Big TWO already?! 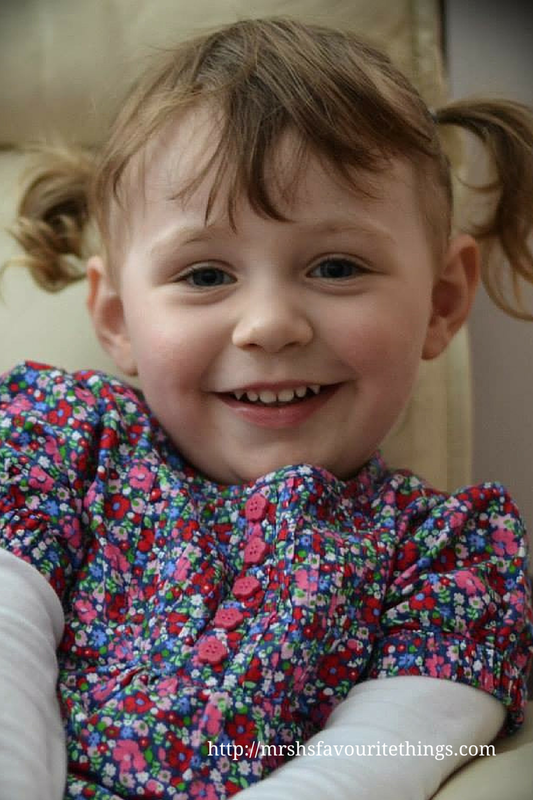 How cute is little miss, she looks like a cheeky little thing :D! 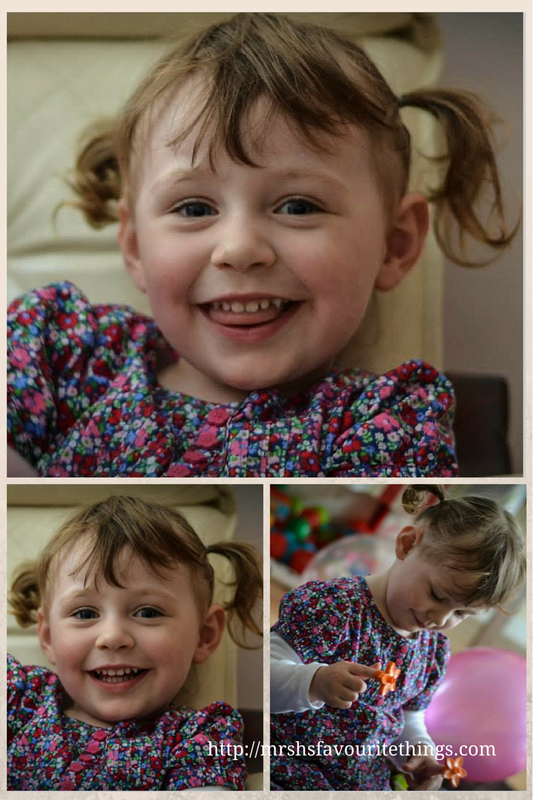 What absolutely stunning photos of Little Miss H. Gorgeous. Those cakes look amazing, I want one now. Beautiful party things. Very lucky little girl. 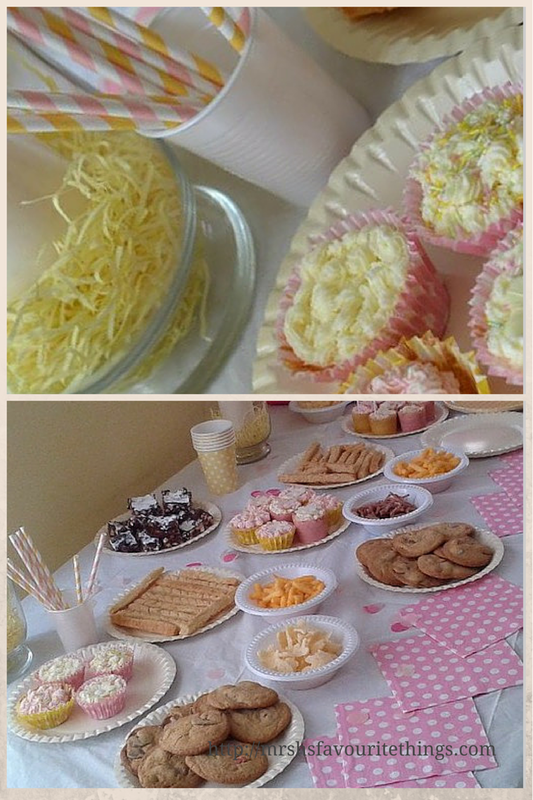 It looks like the gorgeous little Miss H had a lovely party and I hope you had a nice day too. I’m so pleased to see you back blogging, I was really missing reading it. Keep being kind to yourself and being such a wonderful mummy to little Miss H.
What a lovely theme!! I love all these little accessories that you can get for parties these days!! It’s so ‘American’ isn’t it? They seem to do this kind of thing so well… lovely that we’re able to get similar products now too. I didn’t realise that little miss H was so close in age to my Twinkles either!! Ahh she’s a beauty! Ahhhh I love it. I’m obsessed with anything bee/ladybird themed at the mo. (A peek into J’s wardrobe and you’ll see what I mean). 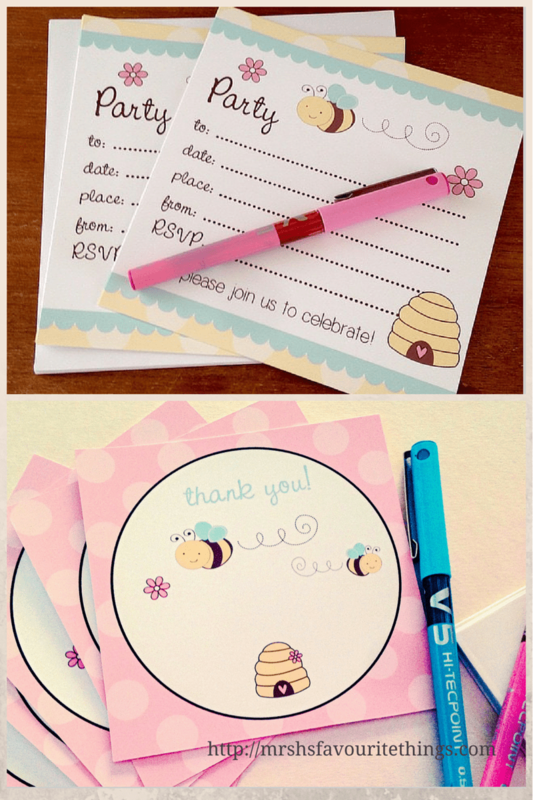 Love the bumble bee party bits, so cute! !